The German learning adventure continues! 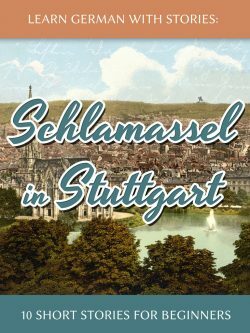 Join Dino & Elisabeth on a strange quest across the valley basin of Stuttgart and learn about local culture & cuisine along the way. When I first started gaming back in the nineties in Germany, there weren’t too many games around in my native language. While most adventure games were eventually translated into German, the English originals were simply much easier to come by. So I took the challenge and made my way through the first Monkey Island and Zak McKracken adventures in English, picking up a lot of (useful?) vocabulary and grammar along the way, while my English lessons in school were still circling around the ole’ “stick, stuck, stuck”. To make a long story short, if it hadn’t been for English games (and later: movies & books), my Anglosaxon skills would be in a sorry state. So today, I’d like to return the favor by pointing out a few games on the popular Steam platform which can be easily switched to German (the same principle applies to other languages as well, by the way). 1. By changing the language of the Steam client, all games automatically switch over to that language (if available). See the official Steam support for detailed instructions. 2. You can also individually change the language of each game. By right-clicking on a game in your Steam library and choosing Properties -> Language you can switch the game to whatever language is available, independent of your client language. Winner of more than 200 Game of the Year awards, the Elder Scrolls series is an immersive action role-playing game that probably doesn’t need a lot of introductions. The developers put a lot of efforts into making the German version as authentic as possible, down to little details such as consistent usage of the medieval polite pronoun “Ihr” instead of the modern “Sie”. If you want to play Skyrim in German but with subtitles in English, see this little hack. The world-famous strategy game which is all about conquering the world by establishing and leading a civilization from the dawn of man into the space age is fully available in German on Steam, with full audio, subtitles and interface. The third installment of the BioShock first-person shooter series won many awards and comes with full German language support. Last but not least, for all fans of classic adventure games, Daedalic Entertainment’s games, such as Memoria, Deponia and Ednard & Harvey are all available in full German language, because – you guessed it – Daedalic is a development firm from Germany. Want to find out which other games are available in German on Steam? Follow this link to jump straight to the search results on the Steam shop. Help Bert unravel the mystery of the book-threatening"reading machine". What does it want? Where does it come from? And will he be able to protect his leather-bound friends from its hungry jaws? Experience daily life in the German capital through the eyes of a newcomer, learn about the country and its people, and improve your German effortlessly along theway! A picture book for the young and young at heart about an unusual friendship between two pets. In a small seaside town body parts start appearing out of nowhere. To whom do they belong? Can you help Kommissar Baumgartner and his colleague Kommissarin Momsen identify and catch the murderer? In the local zoo a corpse is found in the Panda enclosure. How did it get there? Was it an accident or ruthless murder? Boost your grammar by engaging in sword fights, improve your conversation skills by interacting with interesting people and enhance your vocabulary while exploring forests and dungeons. Experience the second episode of our bestselling “Dino lernt Deutsch” story series for German learners on your stereo or headphones, at home or on the go. In this follow-up to “Ferien in Frankfurt”, Dino finds himself in Cologne, the carnival capital of Germany and home of the Cologne Cathedral. In this sequel to “Karneval in Köln”, Dino is making his way into the heart of Munich, capital of the Free State of Bavaria and home of the world-famous Oktoberfest.. This collector’s edition comprises the first four episodes of the popular “Dino lernt Deutsch” story series for German learners: “Café in Berlin”, “Ferien in Frankfurt”, “Karneval in Köln” and “Momente in München”. This collector’s edition comprises the first five episodes of the popular “Baumgartner & Momsen” crime and mystery series for intermediate and advanced German learners: Mord am Morgen, Die Dritte Hand, Des Spielers Tod, Zum Bärenhaus and Heidis Frühstück. Forget about boring textbooks! Save the world and learn German one sword-fight at a time! This is the complete edition of the Aschkalon fantasy trilogy for intermediate and advanced German learners.